You should never let an unannounced visitor into your home. Professional agents always set appointments in advance of showings. If someone shows up unannounced, it could be for a legitimate reason, but nobody should ever be let in without an appointment. Criminals can use a for sale sign as an invitation. You should consult your local police department for advice on how to safely show your home. A well-manicured lawn, neatly trimmed shrubs and a clutter-free porch welcome prospects. So does a freshly painted – or at least freshly scrubbed – front door. If it’s autumn, rake the leaves. The fewer obstacles between the prospective buyer and the true appeal of your home, the better. Dripping water rattles the nerves, discolors sinks, and suggests faulty or worn-out plumbing. Burned out bulbs leave prospective buyers in the dark. Don’t let little problems detract from what’s right with your home. If cabinets or closet doors stick in your home, you can be sure they will also stick in a prospect’s mind. Don’t try to explain away sticky situations when you can easily oil that sticky lock. A little effort on your part can smooth the way toward a closing. Homeowners learn to live with all kinds of self-set booby traps: roller skates on the stairs, extension cords, slippery throw rugs and low hanging overhead lights. Make your home is as non-perilous as possible for uninitiated visitors. Remember, potential buyers are looking for more than just comfortable living space. They’re looking for storage space, too. Make sure your garages and attics are clean and free of unnecessary items. Bathrooms sell homes, so let them shine. For added allure, display your best towels, mats, and shower curtains. Wake up prospects to the cozy comforts of your bedrooms. Colorful bedspreads and fresh curtains are a must. Let the sun shine in! Pull back your curtains and drapes so prospects can see how bright and cheery your home is. Even in the daylight, interior lights should always be turned on for better showings. 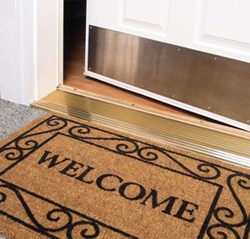 Potential buyers often feel like intruders when they enter a home filled with people. Rather than giving your house the attention it deserves, they’re likely to hurry through. The buyers should always be left alone with their agent to view the home. Rock-and-roll will never die. But it might kill a real estate transaction. When it’s time to show your home, it’s time to turn down the stereo or TV. Some soft background music can be a plus, but when in doubt, keep things quiet. Now that you’re all set and waiting for your first buyer, you should begin planning for your move.